Inaugural edition of the tournament to be held from April 17-20. Seventh event of PGTI 2018 carries a prize purse of rs 30 lakh. Mr Uttam Singh Munday, CEO,PGTI.said. “we are delighted to announce the addition of the Paramount Gold Foreste delhi-NCR open to the PGTI calender. The launch of this new event is a tribute to the golfing legacy of the Delhi-NCR regions which has produced many golfers of the international repute over the years .We thank paramount Golf Foreste for partnering with us new initiative”. Mr Aswani Parkash ED Paramount Group has assured all assistance and gives best business deal to many corporate.We are proud to be associated with this tournament this tournaments to give lots of opportunities to budding player of golfers. Honey Baisoya said as he has won last good be back home. Amardip also said we are happy to be back home where we haves ks of members. Bangladesh, Md Zamal Hossain Mollah. Sagar Media Inc Catalona protest to release leaders.Australia bush fire reach Sydney suburban to dwelling . Israel destroy longest tunnel by Palestinian.Macron say Trump not to pull out troops in Syria .Pak army build up on (link: http://borders.PM) borders.PM leave for Sweden today. US to impose more sanction on Russia and its companies with Russia on side of Syria. San Francisco bans use of bottle water for its enormous waste and create methane gas. Syrian President Bashar al-Assad said after the attack by US, France and UK on suspect of chemical weapons used he is determined to defend and combat more aggressively with radicals for sovereignty rather look for efforts of peace. April 15 (Xinhua) — Syrian President Bashar al-Assad said Sunday that the U.S.-led missile strike on Syria was coupled with a campaign of lies in the UN Security Council, according to the state news agency SANA. The tripartite strike launched by the United States, Britain and France against Syria, the campaign of lies and misdirection at the UN Security Council against Syria and Russia proved that both countries were fighting not only against terrorism but also breach of the international law based on the respect of the countries’ sovereignty, Assad said. MOSCOW, April 15 (Xinhua) — Further actions violating the U.N. charter such as the recent U.S.-led strikes on Syria will result in chaos in international relations, Russian President Vladimir Putin told his Iranian counterpart Hassan Ruhani over phone on Sunday. The two leaders condemned Saturday’s airstrikes by the United States and its allies on Syria and agreed that it would hinder the process of a political settlement in the war-torn country, according to a Kremlin statement. “It was stated that this illegal action seriously damages the prospects for a political settlement in Syria. 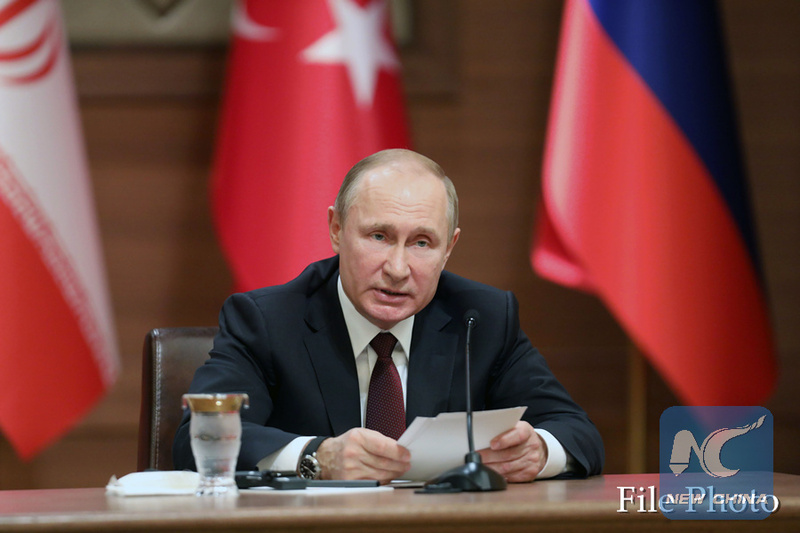 Putin in particular stressed that if such actions, carried out in violation of the U.N. Charter, continue, it will inevitably lead to chaos in international relations,” the statement read. The United Nations Security Council on the same day held an emergency meeting over the missile attack at Russia’s request but failed to approve a resolution condemning the bombardment.